Manager Stenhousemuir, Stirling Albion, St Mirren, Aberdeen, Clyde, Scotland U21, Dundee United, Ross County, Falkirk. Alex Smith’s lifelong devotion to football started at Stirlingshire youth team Gowanhill United before joining Kilmarnock in 1958. His senior career continued at Stenhousemuir, Stirling Albion, East Stirlingshire, Albion Rovers and a second spell at Stenhousemuir. Smith’s managerial career began at Stenhousemuir in 1968 and in 1974 he became manager of Stirling Albion, a club he would manage for twelve years, winning the Division Two League Championship in 1977. In 1986 he became manager of St Mirren and led the Paisley club to Scottish Cup glory the following year with Ian Ferguson’s extra time goal at Hampden Park sealing a famous victory over Dundee United. 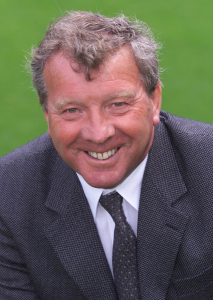 Along with co-manager Jocky Scott, Alex Smith succeeded Ian Porterfield at Aberdeen in 1988 and the Pittodrie club would challenge Rangers at the very top of Scottish football, finishing runners-up in the Premier League for the next three seasons. The ‘Dons’ also won the Scottish League Cup and the Scottish Cup during season 1989-90. Smith left Aberdeen in 1992 and would go on to manage Clyde, Dundee United, Ross County and Falkirk. During a long managerial career his appointments also took in the Scotland under 18 and under 21 sides.